Upon first look the Russell Hobbs 23260 Supreme Steam Traditional Iron has a modern air to it. The design is nice and streamlined looking, with a white and black smooth handle, that connects to the slightly transparent turquoise body. In my opinion this is a very nice looking iron. Compared to the large amount of irons that I have seen it looks futuristic and ready for action. But looks isn’t everything, and what most people find more important is the handling and performance that is provided. It comes with the basic features that you should expect from a steam iron in this price range, from Russell Hobbs. It has vertical use capabilities, allowing you to hold it at weird angles and still get excellent performance from it, and use the steam shot. Adjusting the temperature is also standard, a large wheel on the top that you can turn and chose either the 1, 2 or 3 dot setting. The baseplate is a ceramic non-stick type, combined with the pointed tip in front, ironing is very smooth and easy, unlike most traditional irons. Together with the average weight of the iron the 23260 Supreme makes for a buttery smooth experience, even with heavily wrinkled clothes. The nice smooth ergonomic handle makes it comfortable to use for long periods of time, so if you have a huge pile of clothes to de-wrinkle you don’t have to worry about a cramping hand. The supreme steam comes with an extra fast 2600 watt heat up time, which should come in handy for those who find themselves scrambling for time before bed or in the morning before work. For the price you can’t really go wrong. This iron is sure to last a long time. 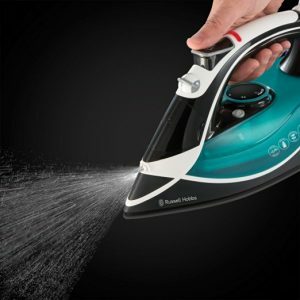 If your looking for something that will provide solid basic use, and allow you to do big loads of steam ironing then its also an excellent choice. 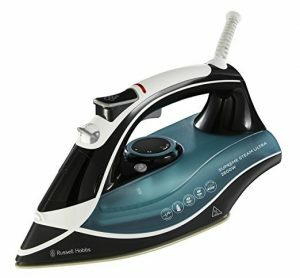 One thing it seems to be missing which we would have liked to have seen on this Russell Hobbs 23260 Supreme Steam Traditional Iron is an auto-shut off feature. 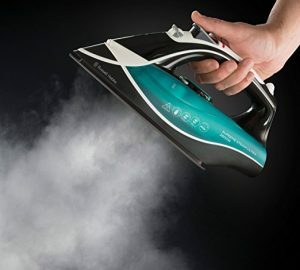 If that doesn’t bother you than this could be your perfect go-to iron. The build is exceptional on this iron as well, so if your looking to buy this for the whole family and expect some big time use and maybe some dropping, then the 23260 iron fits the bill.